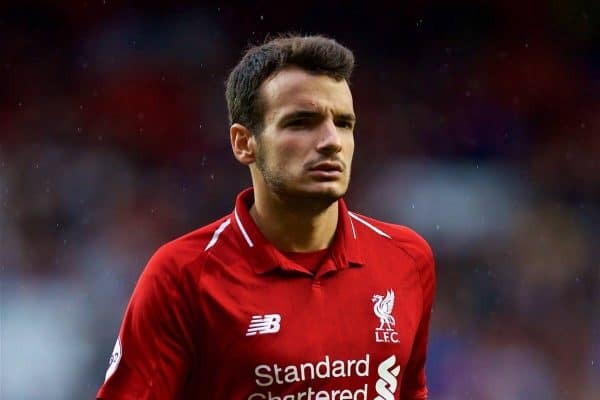 Liverpool midfielder Pedro Chirivella has completed a deadline day loan move to Spanish side Extremadura. Chirivella, who made his debut for the first-team back in September 2015, turned down a permanent move to Rosenborg in the summer and had been linked with Championship sides Nottingham Forest and Swansea this month. However, the 21-year-old has instead returned to his native Spain for the rest of the season to second-tier Extremadura. Signed from Valencia in 2013, Chirivella hasn’t made a competitive appearance for Liverpool since May 2016. Instead, he has been a regular for the Reds’ under-23s, making the joint most appearances this season. The Spaniard becomes the third player to leave Anfield on deadline day, with fellow under-23s regulars Matty Virtue – permanent move to Blackpool – and Liam Miller – loan to Kilmarnock – also departing. One player who has ended up remaining on Merseyside is Ben Woodburn. The teenager’s loan move to Hull City fell through and he’ll now look to force his was into Jurgen Klopp‘s thinking in training. Another who also remains on Merseyside is Lazar Markovic. The Serbian’s contract is up in the summer and he’ll finally leave Anfield then.